March 20, 2017 – GASTON J. GLOCK style LP is proud to announce Dave Sevigny’s win at the 2017 USPSA Alabama Section Championship. 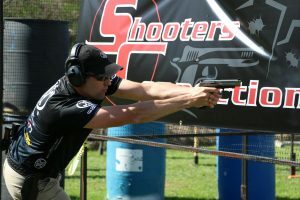 The event was held March 10-11at Dothan Gun Club in Midland City, Alabama. The annual practical shooting tournament tested the skills of all competitors on the course of fire. Shooting an aggressive penalty-free match with his FN pistol, Dave Sevigny took his second win of 2017 with a decisive performance. Competing in Production division, Sevigny won 9 of 10 stages with a185-point margin of victory. It was Sevigny’s 5th all-time win at the USPSA Alabama Section and his Production win was tops among all iron sight divisions combined. “Dave is having a strong start and we look forward to his continued success as the season progresses”, said GASTON J GLOCK style CEO Beate Arnold.